but the body is weak. 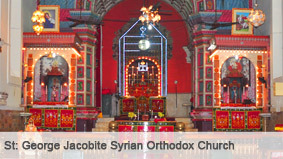 Kadamattam St.George Jacobite Syrian Orthodox Church is one of the famous churches in India under the Holly See of Antioch and the East. The church is established by Mor Abo ,A Persian priest with the help of “Aikunnathu Karthakkanmar” in AD 865 (Year 40 of MalayalamEra) It is believed that Mor Abo stayed in a hut with a poor widow and her only son named Paulose in AD 865.